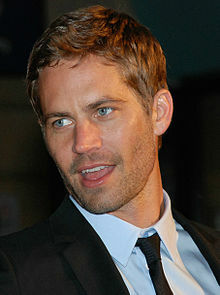 Paul William Walker IV (September 12, 1973 – November 30, 2013) was an American actor and philanthropist. He is best known for portraying Brian O'Conner in The Fast and the Furious film series. The first movie that he acted in was Monster in the Closet where he portrayed "Professor" Bennett. Before he died, he appeared on the National Geographic Channel series Expedition Great White. Walker was born in Glendale, California. His parents were Cheryl (née Crabtree), a fashion model, and Paul William Walker III, a sewer contractor and a fighter who was a two-time Golden Gloves champion, He had English ancestry, with a smaller amount of German, and possible Irish ancestry. His paternal grandfather, a professional boxer, had English immigrant grandparents. One of his grandfathers raced factory cars for Ford in the 1960s. He was the oldest of five siblings. Walker was raised primarily in the Sunland community of Los Angeles and attended high school in the San Fernando Valley, graduating from Sun Valley's Village Christian School in 1991. He was raised as a member of Church of Jesus Christ of Latter-day Saints. After high school, Walker attended several community colleges in Southern California, majoring in marine biology. On the afternoon of November 30, 2013, it was reported that Walker was the passenger in a friend's car when the driver lost control and crashed into a tree. The car exploded and burst into flames, killing both Walker and the driver. ↑ "Paul Walker Leaves Entire $25 Million Estate to Daughter". People. February 4, 2014. Retrieved March 8, 2017. ↑ Weisman, Aly. "Paul Walker Left His Entire $25 Million Estate To His 15-Year-Old Daughter — But Things Could Get Messy", Business Insider, published April 2, 2014. Retrieved May 11, 2015. ↑ 4.0 4.1 "'Fast & Furious' star Paul Walker dies in car crash". Los Angeles Times. Retrieved November 30, 2013. ↑ 5.0 5.1 Keck, William (September 27, 2005). "Fame lets Paul Walker dive in". USA Today. Retrieved January 7, 2014. ↑ Atkin, Hillary (June 6, 2003). "Walker's in the 'Fast' lane to film stardom". USA Today. Retrieved January 7, 2014. ↑ 7.0 7.1 Hobson, Louis B. (June 17, 2001). "Paul Walker kicks it into high gear". Canoe.ca. Retrieved December 5, 2013. ↑ "Paul William Walker II". Retrieved January 7, 2014. ↑ Paul William Walker II 1930 United States Census. https://familysearch.org/pal:/MM9.1.1/XC96-MHS. Retrieved January 7, 2014. ↑ "Meet Paul Walker". Spartanburg Herald-Journal. March 29, 2006. Retrieved January 7, 2014. ↑ "Stars React To Paul Walker's Death, Other Crash Victim Identified". CBS Los Angeles. December 1, 2013. Retrieved January 7, 2014. ↑ Gazzar, Brenda (December 1, 2013). "'Fast & Furious' star Paul Walker remembered as kind, carefree". Los Angeles Daily News. Retrieved January 7, 2014. ↑ "Paul Walker Bio: Fast & Furious Actor". Tribute. Tribute Entertainment Media Group. Retrieved January 7, 2014. ↑ "Official Facebook page statement on Walker's death". Facebook. Retrieved January 7, 2014. This page was last changed on 8 April 2019, at 12:06.